Bought this dress to wear after my wedding. Since I am getting married on the beach in December and the party is at a 5 star restaurant I didn't want to walk in with my full length gown on so I purchased this one and let me tell you it's PERFECT. The quality is fantastic my only advice is to please measure yourself first before ordering as I think this dress runs a little small. Besides that I know it's going to look fantastic for the dinner party. 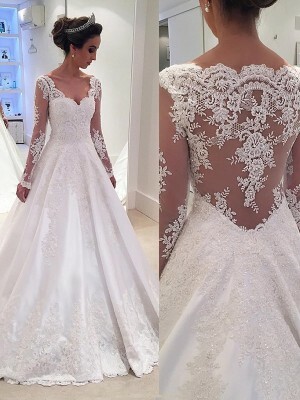 The dress fits like a dream, exceeds expectations. The detail and quality are not what I expected for such a great price. Lovely, casn't be happier! Salve, vorrei acquistare questo abito, ho visto il video di come prendere le misure, ma mi chiedevo la misura dalla fossetta del giugulo fino a terra essendo presa senza scarpe non fa si che il vestito una volta indossato con le scarpe risulti essere un pò corto. Io non so ancora che scarpe indosserò ma se dovessi indossare un paio di scarpe tacco 12, con il vestito misurato senza scarpe non rischio che il vestito risulti essere corto davanti? Absolutely love the dress! It is very well made and is even prettier in person than in the picture. Can't wait to get married in it!